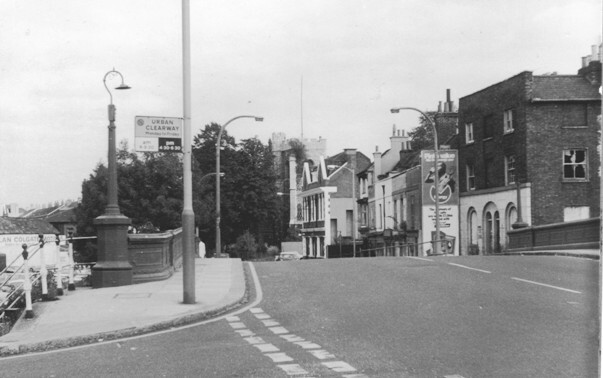 Quentin Pickard has provided this photo which he took in 1972, showing Brentford Bridge and looking eastwards along the High Street. At this point some of the buildings running up to Brentford Bridge appear run down: the house nearest the bridge, no. 158 has smashed windows. See a similar view taken by Arthur Peters in 1975 by which point demolitions had started. Hoardings advertise milk: 'Pinta value fills the energy gap' and General Accident. On the left is a sign for 'Alan Colgate Motors'. Also see a similar view by Dave Stoneleigh, 2008.